It has always surprised me how few Mexican (and Middle Eastern) restaurants are nominated each year. The list of places that are worthy and unrecognized is very long, and so it's tough to choose just one that really deserves LTH's recognition. But I think, at least for me, Nuevo Leon is it. It is almost certainly not the best Mexican restaurant in the city. The moles are not homemade (and not particularly good) and the menu never changes. But still, what they do well they do very well. And the homemade flour tortillas are my favorite flour based anything in the city. Unfortunately Nuevo Leon has never gotten its own thread on LTH. It was discussed a lot on the old board, and I think that punishes some restaurants unfairly. Even if we haven't talked about it here, we've talked about it. G Wiv wrote: Nuevo Leon has been one of my go-to places for years, long hours, reasonable prices and flavorful home style Mexican food. PBAndFluff wrote: Nuevo Leon is a good deal and great Mexican (especially the chicken in Mole sauce, the mexican hot chocolate and Pan Dulce- fresh mexican sweet bread-sugar/cinnamon topping on a flaky roll). Antonius wrote: For such a meal in Pilsen, I would strongly recommend Nuevo Leon. It's good, solid norteño fare (so lots of familiar stuff that's well executed, such as fajitas, burritos, etc.) at reasonable prices. Seanchai wrote: Really, really like that place. The pleasant waitress brought complimentary chips with red and green salsas as well as a small bowl of marinated grilled beef with tortillas. All very tasty, salsas very fresh. We ordered refried beans with chorizo (full of lard probably but oh so good), tacos carne asada and enchiladas with black mole. Prices are extremely reasonable. While I know it’s just another good option among many for you folks, I would kill to have a place exactly like this within 100 miles of central Virginia. Sigh. Mike G wrote: All in all, a disappointing, cranked-out-by-the-factory meal from a place I had good memories of; less Nuevo Leon than Nuevo Leona's. Nuevo Leon isn't the best Mexican restaurant in the city. It might not even be the best Mexican restaurant in Pilsen. But it's a fantastic neighborhood restaurant, all the same. n.b. this nomination is for the 18th street location only. Although I give enormous weight to A&A's recommendation of the 26th street location, it looks like no one but them has posted about it yet. I am really very happy to see you make this nomination and declare my whole-hearted support for it. Nuevo Leon is not various things -- not exotic, not up-scale, not a place with a huge menu nor even a liquor licence. But I love it for what it is -- as I said in the little quote from me above, it's absolutely solid norteño fare. The service is always genuinely friendly and good in my experience, the basic strengths of their kitchen are always turned out with consistent quality and there are some items that are especially wonderful. The flour tortillas I really love (I know there are other styles of flour tortillas too, but these are really great in their own substantial right) and when dressed as tacos de Sabinas, that's a heck of a tasty meal. Last week I stopped in alone for a quick lunch and ordered an old stand-by, the taquitos pasadita -- five small corn tortillas with griddled steak, cilantro, onion, lime wedges and the cooked salsa (in a molcajete) on the side -- and as always the meal was simplicity and perfection. Nuevo Leon definitely deserves this recognition. The other La Villita Nuevo Leon -- which is not directly affiliated with the Pilsen establishment of same name (owned by brothers) -- also deserves this recognition but, as Gleam indicates, it doesn't have the track record on this board yet. I had one meal at Nuevo Leon and found it... uninspiring. Given the profusion of alternatives, I have not chosen to go back. So for me, that one meal was less than great FWIW. I agree. I love their guisados and their tamales. I love their friendly efficient service. I love watching busboys and visiting kids skidding down the ramp between the upper and lower levels in the west room. I love how fast the line moves even when it's out-the-door when I arrive. I love to bring out-of-town guests (and suburban friends) there after a visit to the Mexican Fine Arts Museum. It's a great GNR nomination. Thanks, Ed. 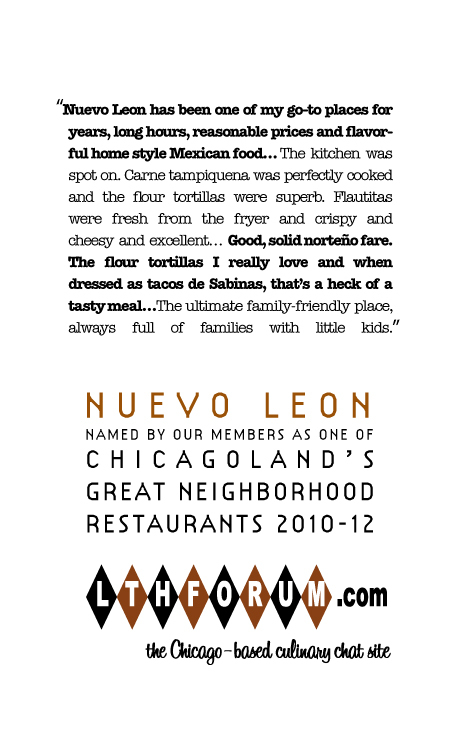 I'm happy to "fourth" gleam's nomination of Nuevo Leon. I’ve eaten at Nuevo Leon probably on the order of 30-40 times. And I’d be happy to go back again, any time. Is it possible to get something there that is “uninspired”? Sure. But there is so much there that is good that I never hesitate to recommend it to friends. (See the thread gleam linked to for some of my specific recommendations.) Their menu also has some dishes I haven't seen elsewhere, such as the queso panela appetizer, or the cazuela especial, which also includes slices of panela cheese. Furthermore, Nuevo Leon is the ultimate family-friendly place. It’s always full of families with little kids; our own son celebrated his first and third birthdays there. (A picture from birthday #3 is in one of those linked threads.) Once when we were there, the upper part of the west room was taken over by a big family birthday party, complete with live music. A Mexican-American friend of ours has for years had a weekly lunch with his brother there. It’s the go-to place for many Mexican families on Mother’s Day. I remember going to Nuevo Leon quite a bit when I was pregnant, and had the godzilla-sized appetite to really do justice to their generous servings AND order dessert afterwards. Somewhere on this site I told the story of being in Pilsen on a January night, unable to get a taxi to come to the neighborhood. I don't think I identified the restaurant before: we were at Nuevo Leon, and the owner ended up having one of the busboys drive the three of us home. Nuevo Leon is a great place, dear to my heart as well as to my stomach. I need to get back there again soon. Is this the birthday photo? We almost always go to NL after about 7:30pm, usually on a weeknight, and so I don't think we've ever once had to wait for a table. In case anyone is planning a trip to see how they feel about the place. We were there last night for dinner, which is what reminded me that the place deserved recognition. The kitchen was spot on. My carne tampiquena was perfectly cooked (medium rare, something you so rarely see in skirt steak in mexican restaurants), and the flour tortillas were superb. Beth's flautitas (with that panela cheese in them) were fresh from the fryer and crispy and cheesy and excellent. The lardy starchy beans were just as they always are - lardy and starchy. Who needs more? And right before we left a party of 6 adults and 12 kids came in, clearly coming from an elementary school graduation. On our way out, some high school graduates headed in. It's clearly a special occassion place for those in the neighborhood, especially when kids are involved. And really, it should be. If you've only been once, consider giving it another chance. There are a some misses on the menu, but also a lot of hits. gleam wrote: If you've only been once, consider giving it another chance. There are a some misses on the menu, but also a lot of hits. Absolutely, Nuevo Leon is not the type of place that jumps right out at you, a little trial and error may be necessary, but there are gems to be found. As you mention the terrific lardy, starchy beans, very nice rice and house made tortillas. Not to mention my favorite chilaquiles in Chicago. I happily 4th, or is it 5th, Nuevo Leon. I'll offer up my support for this well-deserved nomination. Fantastic house-made flour tortillas and excellent guisado, and yes, the beans demonstrate the wonderful things that happen when lard and starch are allowed to interact under the supervision of an expert hand. An easy recommendation for the GNR. NL should be a shoo-in for the GNR. Among a lot of well executed dishes, I'm particularly fond of the lengua tacos (flour tortillas) and most of all the menudo*. Though I get that to go - for breakfast the next day. *While I wasn't able to work in a meal at NL - I did manage to pick up some menudo - our last Chicago breakfast and then A2Fay and I hit the road. Farewell Chicago (but not LTH )! gleam wrote: The lardy starchy beans were just as they always are - lardy and starchy. Who needs more? Well, since you asked. How about Nuevo Leon's Frijoles con Chorizo, a nicely decorated heart attack on a plate. I had my usual Chilaquiles w/chorizo and fresh jalapeno. Mike G, who I had lunch with, took a page from your book, Carne A La Tampiquena. House made flour tortillas, made with a touch of lard, were wonderful. Even I almost feel guilty scooping up luxuriously lardy refried beans with the tortillas. Even though NL was quite crowded they were handling it well, nicely fresh chips, good salsa and pickled veg and coffee refills. Great nomination Ed, NL was, is and remains a go-to place for many LTHers. I love Nuevo Leon. I'm a little ashamed to admit that, despite its relative deistance from our home, it's just about the only Mexican place we go for breakfast, and that we don't go there for much other than breakfast. But it sure is nice to get little tacos as a breakfast amuse. It's nice to get a breakfast amuse at all. I really should branch out a bit in terms of Pilsen restaurant experiences, but it's just such a warm and friendly place to bring the kids, it's hard to choose somewhere else. It makes me wish Pilsen was my neighborhood. And thanks for the mention and photo of the frijoles con chorizo--my comfort food of choice through the decades. For a while it disappeared from the menu--I think it was in the 80s after they remodeled the first room and added fajitas. But you could always get it. I love Nuevo Leon and in spite of the plethora of other great Mexican places in Chicagoland, it continues to scratch the itch for me like no other. I took some friends who had never been there for lunch a couple of months ago. Our lunch was great and of course, my friends loved it. It almost feels like cheating when you bring people to NL for the first time because it's a virtual lock that they are going to love it. You end up getting all the credit for simply leading people to NL's door. That's how reliable, consistent and delicious it is. I heartily endorse Nuevo Leon for GNR renewal. ... I would like to endorse -- and I should add, wholeheartedly so -- the renewal of the GNR for Nuevo Leon, which remains not only a vital neighbourhood institution in Pilsen but also a consistent purveyor of first rate norteño fare. My previous, reasonably ample comments on this restaurant all obtain without change -- there are a number of dishes that they do especially well (fajitas, taquitos pasadita, chuletas, the red guisado) and the service and atmosphere always make a visit a great experience. ... And the tacos de Sabinas remain one of my favourite restaurant dishes available in this city. I had brunch there today and only my third meal there ever. The carne en chile amuse was good as were the freshly fried chips and the salsas. I ordered machacado con huevo, my all time favorite huevos dish and it was good but not as good as at Perez, my Mexican breakfast stalwart in the west loop (and now with a second location close to NL on 18th). The meat was really the best part, stringy in a pleasantly toothsome way with crisp griddled bits. My major complaint about this dish as with the revered chilaquiles, and all other "ala mexicana" style eggs here is the overly processed nature of the ingredients- veggies are too finely diced- I like to see half moons of jalapeno and big melted chunks of tomato in my huevos. The eggs themselves, also, are scrambled too quickly and yield a grainy consistency. I'm a big curd man. Also, much of the rest of the fare I consider to be consistently blanketed in cheese- even cheddar?! Some of the stuff might even be too lardy for my taste. All this said, the amazing handmade flour tortillas may keep this place in semi- annual rotation. Tacos sabinas are really nice on those tortillas, but leave me feeling over-stuffed. I cannot rate Nuevo Leon next to Cemitas Puebla, Taqueria Oaxaquena, Xni-pec, or many of the simple carnitas and birria spots up and down 18th. But then again, maybe I prefer the more southern cuisines of Mexico. Lucantonio and I were on our own the other night for dinner -- a buddy of Antonius's called with a spare ticket to the Hawks/Ducks game -- so the two of us made a quick run down to Nuevo Leon. Here's why N.L. is a great neighborhood place for us: we knew we could get some great food, exactly what we were in the mood for (carne asada tacos for L, tacos de sabinas for me); we knew there'd be a table open, no waiting, and a completely relaxed atmosphere for a mom and kid. We enjoyed our meals, including the always-charming amuse, had friendly service, and even got some of the CPS-required 20 minutes/night of reading in at the table. A great option for a weeknight. A great neighborhood restaurant that made us feel part of their neighborhood. I certainly endorse the renewal of Nuevo Leon's GNR. My wife and I have been there a few times but we were underwhelmed each time and will probably not go back. Some of the carne asada dishes were good but not enough for us to make a trip, everything else was just so-so. Maybe just because my wife is from central Mexico and we seem to prefer styles further south than Nuevo Laredo (a town which I've actually been in a few times and had very good food there). This is a restaurant that sems to have a mystique out there that I can't for the life of me understand. I enthusiastically support the renewal of Nuevo Leon's GNR. On those occasions when we want a sit down Mexican food experience (as opposed to a quick taqueria stop), we often choose Nuevo Leon. We love the guisado de puerco, the fresh, house-made flour tortillas, and the warm fuzzies that we always get when the amuse bouche shows up. For me, this is a no-brainer automatic renewal. I have struggled with this place - a couple of meals that were nothing special. Last time I went, I did some research and focused just on the recommended dishes on the other posts here, specifically chilaquiles that day, and my meal was quite good. Does that make it a GNR? Probably not for me, but I finally feel like I get it, and will eat well the next time I go (the location seems to work for near south and near west side rendez vous, I guess, so I will go back, not eagerly, but at least willingly from now on). Sometimes nothing but chilaquiles with chorizo and fresh jalapeno will do, its one of my favorite breakfasts in the city, though I've been known to have it for lunch or dinner. Lard love flour tortillas, refried beans and the only ten dollar a meal restaurant I know that serves an amuse. GNR renewal, yes, by all means. Nuevo Leon, count me a fan! Since I suggested Nuevo Leon for reconsidering, I should respond. I enjoy going to Nuevo Leon, but frankly no more than many other mainstream Mexican restaurants. It was an iconic restaurant when Mexican Pilsen was largely unexplored by foodies. And the restaurant is still fun. But the food is really quite ordinary Mexican cuisine. I don't find the preparations notably better, and the pictures above on this thread demonstrate this. It is hard for me to remember if the food has declined in quality or simply that I have discovered other options. It is a perfectly fine location for tourists or those who are novices to Mexican cuisine. Not being a GNR is not an indication that a restaurant is of poor quality - that would be unfair - simply that it does not represent the finest possibilities of Mexican cooking at the present time. GAF wrote: Since I suggested Nuevo Leon for reconsidering, I should respond. I enjoy going to Nuevo Leon, but frankly no more than many other mainstream Mexican restaurants. It was an iconic restaurant when Mexican Pilsen was largely unexplored by foodies. And the restaurant is still fun. But the food is really quite ordinary Mexican cuisine. I don't find the preparations notably better, and the pictures above on this thread demonstrate this. It is hard for me to remember if the food has declined in quality or simply that I have discovered other options. It is a perfectly fine location for tourists or those who are novices to Mexican cuisine. There are so many Mexican families in and around the city that would not agree with this. This is one of the best homestyle Mexican restaurants around. "Location for tourists," and place for "those who are novices to Mexican cuisine" are definitely not descriptions of Nuevo Leon. I'm not a huge fan of the place, though I enjoy going, but if I grew up in a Norteno household, I'd bet NL would be one of the best "comfort food-ish" places in the country. So many of my Mexican friends absolutely adore this place, that I had to speak up - not because of my love for the place, but because I think you might be mistaken on your take of what this place is about. For novices? I think it might be more for experts. Every time I'm there, it is full of Mexican families, not tourists. I do think that one of the things that made Nuevo Leon iconic was that it did bring these largely distinct communities together in a common space that was comfortable and welcoming for all. At least at one point if one asked where should tourists go outside the tourist areas for Mexican food, it would be Nuevo Leon that would be named, but it clearly has local support as well. (Not being part of the community, I don't know how it compares to other places, but it is frequently crowded). But for me, it is good, not great, Mexican comfort food. GAF wrote: But for me, it is good, not great, Mexican comfort food. Nuevo Leon still rings true to me. I've had chiliquillas all over Chicagoland and beyond and Nuevo Leon's version is my favorite. Love the amuse, love the multiple salsas and escabeche, love the fact last time I was there the place was filled with Mexican families beaming at their newly graduated children. I'm for GNR renewal. It is our 'go to' place for breakfast-since hubby does not like regular bksft food. The children love the porkchops, I like the Enchiladas Suizas and hubby likes the Quesadillas Raul and the refried beans. . The Horchata is always fresh and the flour tortillas are the best around. Service is fast, friendly and efficient-even when the place is in the weeds. Seating is tight but if you go early there is no problem. It s a slam dunk for GNR. I had never been to NL for breakfast until recently and now agree that their chilaquiles are the perfect breakfast food. Went early enough that finding a seat wasn't a problem and really enjoyed the neighborhood feel as well because lots of the guests seemed to recognize each other.